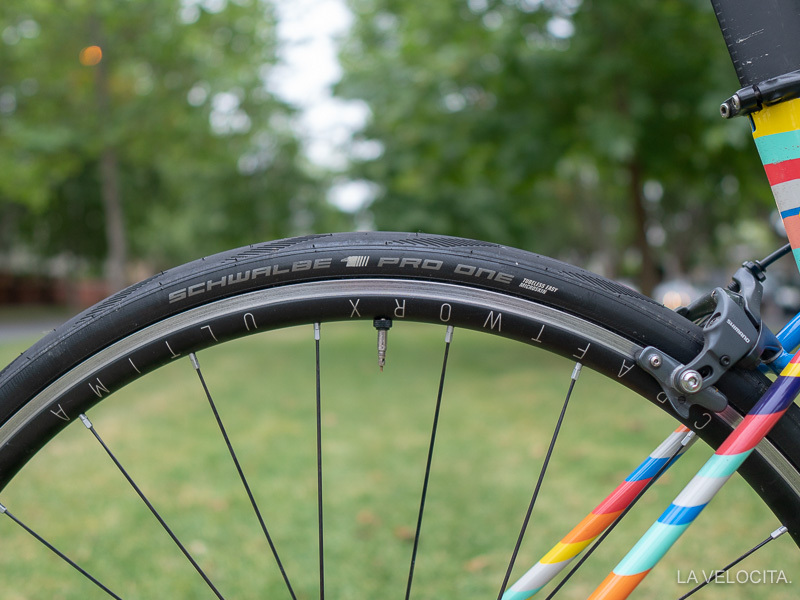 Schwalbe Pro One Tubeless review - LA VELOCITA. I started dabbling in the dark art of road tubeless tyres about 2 years ago on an endurance bike with big ‘ole fat 32-35 mm tyres. I’ve been a tubeless believer since then, but took me until late 2018 to take the plunge on performance road tubeless. Despite being a tubeless convert, there’s no denying that setting it up can be a massive pain in the arse. Some setups are easy, as the Specialized Roubaix Pro 2BRs were on my Curve. Some are a messy, bleeding-thumbed crapshoot like the WTB Trailblazers on my Bombtrack. You just don’t know until you try. Anyhoo, I finally pulled the trigger on the highly regarded Schwalbe Pro One Tubeless. Is this the tyre I’ve been waiting for? Wrestling the tyres onto my Craftworx Ultima rim was right on the middle of the tubeless horror spectrum. It was doable but needed some patience and a couple of good quality tyre levers. I use Crank Brothers Speedier Levers for anyone looking to make tubeless life a little easier. Once I’d popped them onto the rims, it took a few blasts from my Bontrager Flash Charger pump to pop the tyres onto the bead. These tyres are tight. I did have to get some help from my LBS with the rear wheel as a crappy valve was letting air seep out. A new valve later and the setup was holding air like a legend and I was ready to roll! The excitement of new tyres was slightly tempered by the Pro Ones having to follow the Specialized Turbo Cottons (read my review/love letter to those) that I fell unashamedly in love with. I wore the Turbo Cottons down to tissue paper and only abandoned them when a fairly blunt stick caused a puncture. So, how did the Pro One feel as a replacement to my favourite clincher? “Plush” is the first word that springs to mind with the 28 mm width setup tubeless at 60 psi. The added air volume gives a lovely, floaty feel as the tyre absorbs bumps and vibrations. Interestingly the visible flex in the sidewall was less in the Pro One than the Turbo Cottons that were 26 mm and ran at 70 psi. That’s indicative of the different avenues to comfort; a super-supple sidewall and high TPI Vs a thicker sidewall with lower TPI set tubeless. The Pro Ones gave my road bike of choice - the riotously stiff Specialized Allez Sprint - a properly comfortable ride. As for handling and grip; the words that spring to mind are “pretty good”. The aforementioned Specialized Turbo Cottons were corner-railing-descent-shredders that made every ride a joyful experience. The Pro Ones lack the razor sharp handling of the Turbo Cottons, with less turn-in grip and mid-corner confidence. The Pro Ones fall in the same region as Continental GP4000S IIs, and Vittoria Corsas in terms of grip and handling. They’re solid, but nothing I’d rave about. For the nerds, bicyclerollingresistance.com have run their rolling resistance lab tests on the Schwalbe Pro Ones and they scored an excellent 11 Watts of rolling resistance at 120 psi - although you’d have to be bananas to run that pressure. Check out the full test on Bicycle Rolling Resistance. The Pro Ones were very well behaved during the first 3,000 km of their existence. They haven’t budged from the wheels. All I’ve done to them is pump them up every few days, less frequently than any tubeless setup I’ve had before, and shoot some more sealant in before heading interstate for some riding. There’s some spots of dried sealant on the seatpost and seat tube indicating something has punctured the tyre but I didn’t notice it while riding so the Muc-Off sealant has done its job. Other signs of wear and tear are quite mild for a performance oriented tyre of this age. I haven’t been nice to them either. My Allez does road and gravel in nice weather and some utter garbage rain. There’s slight flattening on the front tread and more noteworthy flattening on the rear. There’s a standard array of small marks. I expect a couple thousand more kilometers before turfing the Pro Ones. Nonetheless, these are performance tyres and wear faster than harder rubber. There’s a reason Schwalbe Pro One Tubeless tyres have become well respected among the earlier adopters of performance road tubeless. They’re not too hard to fit, they’re nice enough to ride, and they roll well. I’m not so much impressed by the dynamic capabilities of the Pro Ones because they’re not remarkable. 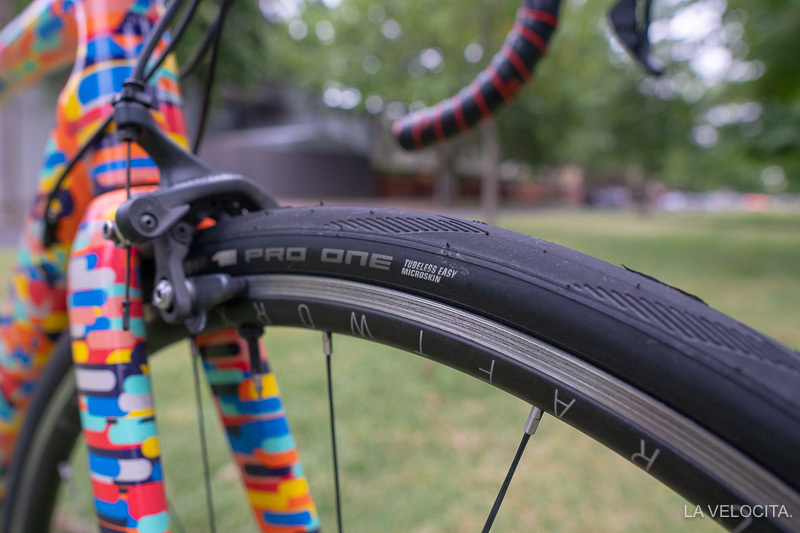 There’s plenty of tyres this good or better to ride on. I am impressed by the easiness of them as a tubeless tyre. Road tubeless feels like it’s matured to the point I’d advocate people switch over, and the Pro One Tubeless will certainly be a tyre I’d recommend.